Southern Poverty Law Center’s Heidi Beirich on tracking hate incidents. Hate crimes are among the most undercounted offenses in the U.S. The Southern Poverty Law Center is trying to firm up a shoddy data set. 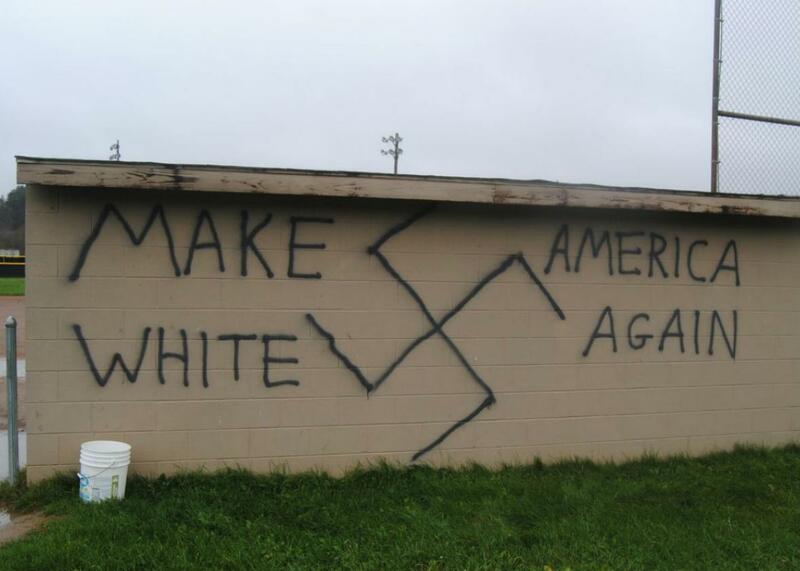 Graffiti invoking President Trump’s campaign slogan with a racist message at a park in Wellsville, New York. The graffiti was reported the day after the 2016 election. The Southern Poverty Law Center rushed to track the surge in reported hate incidents after the election—a surge that appears to have died down. Heidi Beirich explains the SPLC’s plans to weed any hoaxes out of its data and why it’s a bad idea to minimize incidents of hate just because they don’t rise to the level of a crime. For the Spiel, getting acquainted with Canada’s Trump(s). Points of Courage, a podcast from Hiscox Insurance about the adventure of starting up a business. Check out Points of Courage wherever you get your podcasts, and learn more about how Hiscox Insurance can help protect your business by going to Hiscox.com.